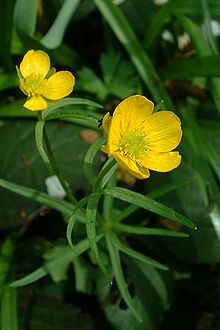 Ranunculaceae (buttercup or crowfoot family; Latin rānunculus "little frog", from rāna "frog") is a family of over 2,000 known species of flowering plants in 43 genera, distributed worldwide. The largest genera are Ranunculus (600 species), Delphinium (365), Thalictrum (330), Clematis (325), and Aconitum (300). Ranunculaceae are mostly herbaceous annuals or perennials, but some woody climbers (such as Clematis) or shrubs (e.g. Xanthorhiza). Most members of the family have bisexual flowers which can be showy or inconspicuous. Flowers may be solitary, but are frequently found aggregated in cymes, panicles, or spikes. The flowers are usually radially symmetrical but are strongly bilaterally symmetrical in the genera Aconitum and Delphinium. The sepals, petals, stamens and carpels are all generally free (unfused), the outer flower segments typically number four or five. The outer stamens may be modified to produce only nectar, as in Helleborus and Delphinium. In some genera, such as Thalictrum the sepals are colorful and appear petal-like and the petals can be inconspicuous or absent. The stems are unarmed. The leaves are variable. Most species have both basal and cauline (stem) leaves, which are usually compound or lobed but can be simple. They are typically alternate, or occasionally opposite or even whorled. Many species, especially the perennials form rhizomes that develop new roots each year. Ficaria verna can reproduce vegetatively by means of root tubers produced in the leaf axils. Some members of the genus Thalictrum utilize anemophily while others utilize entomophily. Flowers of the entomophilous genus Papaver, also of the Ranunculales order, produce only pollen. Until recently, it was believed that the species of the genus Anemone also lack nectar. The fruits are most commonly free, unfused achenes (e.g. Ranunculus, Clematis) or follicles (e.g. Helleborus, Eranthis, Nigella), but a berry in Actaea. Ranunculaceae contain protoanemonin, which is toxic to humans and animals. Other poisonous or toxic compounds, alkaloids and glycosides, are also common. Takhtajan (1997) included the Ranunculaceae as the only family in the Ranunculales which he placed in a subclass, the Ranunculidae, instead of a superorder. Previously, Thorn (1992) placed the Ranunculaceae in the Berberidales, an order within the Superorder Magnolianae. Earlier Cronquist in 1981 included the Ranunculaceae along with seven other families in the Rancunculales which was included in the Magnoliidae, which he regarded as a subclass. David, (2010) placed the Ranuculaceae, together with the Eupteleaceae, Lardizabalaceae, Menispermaceae, Berberidaceae, and Papaveraceae in the Ranunculales, the only order in the superorder Ranunculanae. This follows the work of the Angiosperm Phylogeny Group. The family Ranunculaceae sensu stricto (APG) is one of seven families included in the order Ranunculales within the eudicots according to the Angiosperm Phylogeny Group classification. The family is monophyletic with Glaucidium as sister to the remaining genera. This phylogeny is illustrated in the APG Poster. but by 1988 he had reduced Coptidoideae to a tribe within Isopyroideae, leaving five subfamilies, an arrangement he continued in his 1993 monograph, dividing the larger subfamilies into tribes, though by then Paeonia and Glaucidium were no longer considered to belong to Ranunculaceae. Paeonia was separated from Ranuculaceae and placed in its own family of Paeoniaceae (order Saxifragales). 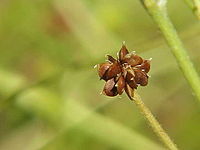 other genera originally included in Ranunculaceae include Circaeaster which was placed in its own family Circaeasteraceae. The genus Glaucidium, having been moved to its own family (Glaucidiaceae), has since been restored to Ranuculaceae. When subjected to molecular phylogenetic analysis only Thalictroideae is monophyletic. The position of Glaucidium and some of its unique morphological characteristics prompted Stevens to suggest that it be given subfamilial rank as the monotypic Glaucidioideae. Similarly Hydrastis has been assigned to subfamily Hydrastidoideae. Both genera are represented by a single species, Glaucidium palmatum and Hydrastis canadense respectively. In addition to the two monotypic subgenera, Coptoideae has 17 species and Thalictroideae has 450, including Thalictrum and Aquilegia. The other genera (2025 species, 81% of the family) belong to Ranunculoideae. Kingdonia had been included by Tamura in Anemoneae, but is now added to Circaeasteraceae. Ranunculaceae contains approximately 43 genera. Fossils of fruits, pollen, seeds, and leaves are known from several dozen locations. The fossil record begins in the early Cretaceous and continues throughout the Tertiary. In most cases, the fossils are assigned to extant genera, or show a close relationship to a particular extant genus. Some Ranunculaceae are used as herbal medicines because of their alkaloids and glycosides, such as Hydrastis canadensis (goldenseal), whose root is used as a tonic. More than 30 species are used in homeopathy, including Aconitum napellus, Cimicifuga racemosa, Clematis recta, Clematis virginiana, Hydrastis canadensis, Ranunculus bulbosus, Helleborus niger, Delphinium staphisagria, Pulsatilla nigricans. Many genera are well known as cultivated flowers, such as Aconitum (monkshood), Clematis, Consolida (larkspur), Delphinium, Helleborus (Christmas rose), Trollius (globeflower). The seeds of Nigella sativa are used as a spice in Indian and Middle Eastern cuisine. ^ a b Pigg & DeVore 2005. ^ a b Christenhusz & Byng 2016. ^ a b c d Clapham, Tutin & Warburg 1981. ^ a b c Stace 2010. ^ a b Ronse de Craene 2010. ^ Ross, Gary (22 December 2016). "Treat Your Bees to a Banquet of Poppies". Bee Culture. A.I. Root Company. Retrieved 6 December 2018. ^ Erbar, Claudia; Leins, Peter (2013). "Nectar production in the pollen flower of Anemone nemorosa in comparison with other Ranunculaceae and Magnolia (Magnoliaceae)". Organisms Diversity & Evolution. 13 (3): 287–300. doi:10.1007/s13127-013-0131-9. Retrieved 6 December 2018. ^ a b c d Wang et al 2009. Christenhusz, M. J. M.; Byng, J. W. (2016). "The number of known plants species in the world and its annual increase". Phytotaxa. 261 (3): 201–217. doi:10.11646/phytotaxa.261.3.1. Langlet, O. (1932). Uber Chromosomenverhaltnisse und Systematik der Ranunculaceae. Svensk Bot. Tidskr 26, 381–401. Keener, Carl S.; Reveal, James L.; Dutton, Bryan E.; Ziman, Svetlana (August 1999). "A List of Suprageneric Names in Ranunculaceae (Magnoliophyta)". Taxon. 48 (3): 497. doi:10.2307/1224562. JSTOR 1224562. Kubitzki, Klaus; Rohwer, Jens G.; Bittrich, Volker, eds. (1993). The Families and Genera of Vascular Plants. II Flowering plants - Dicotyledons. Magnoliid, Hamamelid and Caryophyllid families. Berlin: Springer. ISBN 978-3540555094. Pigg, K. B.; DeVore, M. L. (1 October 2005). "Paleoactaea gen. nov. (Ranunculaceae) fruits from the Paleogene of North Dakota and the London Clay". American Journal of Botany. 92 (10): 1650–1659. doi:10.3732/ajb.92.10.1650. PMID 21646082. Kumazawa, Masao (1938). "Systematic and Phylogenetic Consideration of the Ranunculaceae and Berberidaceae". Shokubutsugaku Zasshi. 52 (613): 9–15. doi:10.15281/jplantres1887.52.9. Emadzade, Khatere; Lehnebach, Carlos; Lockhart, Peter; Elvira, Hörandl (June 2010). "A molecular phylogeny, morphology and classification of genera of Ranunculeae (Ranunculaceae)" (PDF). Taxon. 59 (3): 809–828. Turner, NJ (July 1984). "Counter-irritant and other medicinal uses of plants in Ranunculaceae by native peoples in British Columbia and neighbouring areas". Journal of Ethnopharmacology. 11 (2): 181–201. doi:10.1016/0378-8741(84)90038-2. PMID 6387285. Whittemore, Alan T.; Parfitt, Bruce D. (1997). "Ranunculaceae". In Flora of North America Editorial Committee. Flora of North America North of Mexico (FNA). 3. New York and Oxford – via eFloras.org, Missouri Botanical Garden, St. Louis, MO & Harvard University Herbaria, Cambridge, MA. Ranunculaceae in L. Watson and M.J. Dallwitz (1992 onwards). The families of flowering plants. Wikimedia Commons has media related to Ranunculaceae. This page was last edited on 18 February 2019, at 08:10 (UTC).